We received a spinning wheel signed by Josiah Sanford, the middle of three generations of Newtown wheel makers, all living at the Sanford house - Faith's old house - at one time or another. It is a vertical double flyer/bobbin model, nicely complimenting our Josiah Sanford great wheel. Beardsley Sanford was a cousin from New Haven, but he apparently lived with the Newtown Sanfords from 1794-1811 or 1812; Whether or not it was formal, these would have been his apprentice years and he would have been trained by Samuel and Isaac, along with the three year younger Josiah. He moved to NY for his career, but his training, residence, close connection to the family (he was a witness to Samuel's will) and the fact that as far as I can tell from photographs he used at least the same "S" stamp in signing his wheels, all make him of interest to us. The catalog entry from the Textile Museum is below. 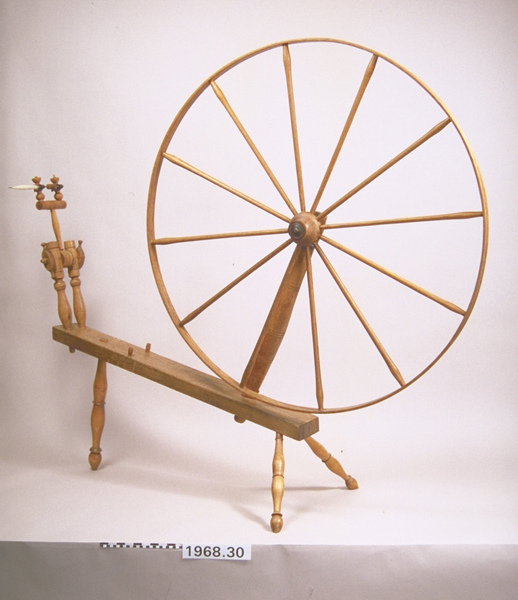 Spinning wheel; horizontal, spindle. Rectangular table rests on three splayed legs. Slanted wheel post fits through table. Drive wheel has twelve spokes and a flat rim. The drive wheel axle fits through the wheel post. Two slanted spindle posts fit through the table, at the top, between them, a block of wood is held by a threaded screw. An incomplete accelerating head, fits into the block. Two pegs set into table near spindle posts. Turnings on legs and spindle posts.